Age Limit : Candidates age should be between 18 years to 35 years. (Age relaxation will be extended to reserved categories as per Govt. Rule). District-Wise-Job-Post in Panchayati Raj Dept. : updated soon. 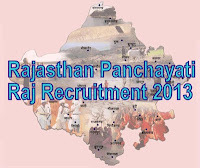 How to apply : Eligible and Interested candidates can apply through official website of Panchayat Raj Recruitment 2013 www.exampraj.rajasthan.gov.in from 18th February 2013. For job Notification visit, Apply Online visit: www.exampraj.rajasthan.gov.in (Please Note this website Link May Not be working sometime with error Message "Server not found, can't find the server at www.exampraj.rajasthan.gov.in" so please visit again before 18th February 2013 OR You can Follow us on GOOGLE+ or FACEBOOK.